TSS Review: UK SEGA Shop Merchandise – Christmas Edition! It’s that festive time of year again! As always, we at TSS won’t be able to sleep on Christmas eve as we are too excited thinking about the Sonic the Hedgehog merchandise Santa will be bringing us in his sleigh! We must have been particularly good this year (we’ve only been completing hero missions), as Europe and the UK now has it’s very own dedicated SEGA Shop crammed with new and exclusive merchandise. Continue reading TSS Review: UK SEGA Shop Merchandise – Christmas Edition! The products in this review were provided by Numskull (unless otherwise stated). So odds are if you’ve been inside GAME, Forbidden Planet or another store which sells video game themed merchandise you’ll probably have seen various Sony themed products creeping in, such as cuff links, wallets and key rings. I’ve noticed, and I always think ‘those look pretty cool’. 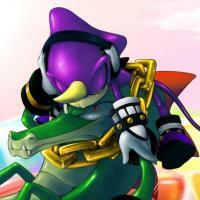 Well, now it seems to be the turn of Sega systems to get this treatment. 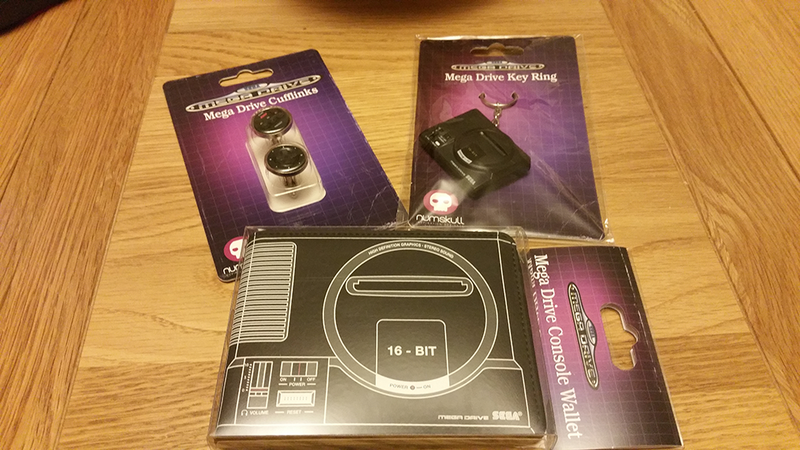 Currently available to buy are a Mega Drive Key Ring, Mega Drive Console Wallet and a pair of Mega Drive Cufflinks. Coming soon are some products based on the Sega Master System, however at the time of the review these do not appear to have been released yet. I think I should start off with my least favourite of the three, the wallet. As it happens, I’m actually in desperate need for a new wallet. Mine is completely falling apart so when I saw this I was pretty excited, the design has captured the classic console exactly and they’ve even included the underside details, it would have been so easy to leave the back of this plain black, however they’ve added the extra detail which is always appreciated. However when I opened the wallet, I quickly discovered that I would never be using this wallet and felt a tad let down. 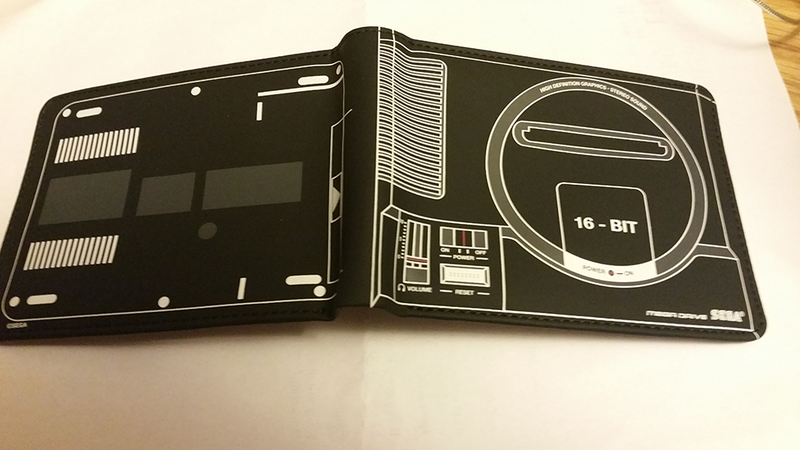 Whilst the outer shell of the wallet looks really cool, the inside isn’t that great from a practical standpoint. Now this might just be me, but I make a point to get a wallet which has some kind of change compartment, unlike many countries which have a $1 note, the UK doesn’t have notes for £1, we have coins, which means we often have change in our wallets. At least my wallet does. But again, this might just be me, hence why I tend to go for much larger wallets with lots of compartments. 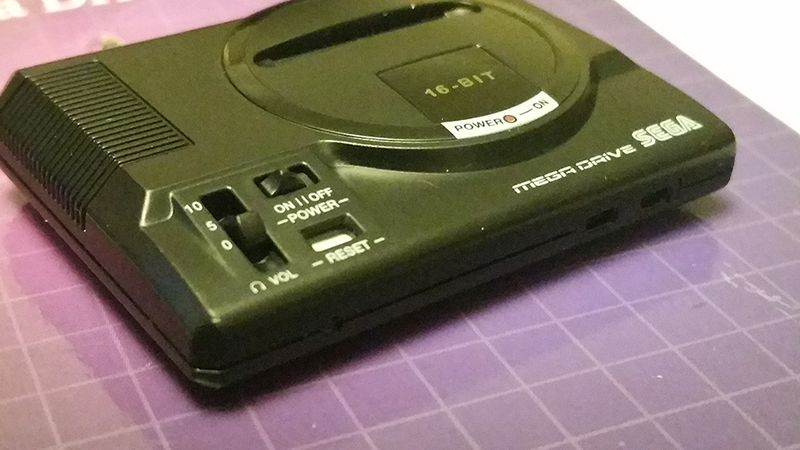 However, if you don’t have many cards, never carry coins, this is a pretty decent wallet, it does exactly what it’s design to, it’s a wallet, it says “Hello I am a wallet, I will do what a wallet does, and I happen to have a MegaDrive design” if that’s something you’re into, what’s the problem? Odds are you’ll like it and use it. Although, you’ll probably need to empty your current wallet to get one, it’s priced at £14.99 at the moment. But that said, this seems to be the going rate for a lot of licensed wallets these days, some of which are even more. Overall, I could sit here and praise this to death, or slate it to death, but the fact is, this is one of those products where you look at it and decide if you like it or not. It’s a wallet, we don’t usually make too many decisions on these other than if it looks like it’ll hold everything we carry around. THIS IS AWESOME! I first saw the render of this and thought ‘there is no way it’ll be that detailed’ oh it is! It is that detailed! Every part of the console has been captured perfectly onto this keyring, there is even some small movement in the volume and power switches! How detailed is this? You know the reset button, it has the tiny black dots on them! they could have so easily left that white and nobody would have cared, yet the detail is there. Even the underside of the keyring has the consoles various air vents and stands! There’s tiny controller ports on it too! It’s very hard to have a problem with this, in fact the only flaw I can find is that the power text is a little off, but otherwise it’s near flawless. Carrying a price tag of £4.99 this is well worth the money. Cannot wait to see the Master System keyring now! Now these are really cool, I have never had a shirt which uses cufflinks, but every time I see some themed cufflinks something in my head always goes ‘I should start wearing those,’ well if I do decide to wear shirts like that, these are the cufflinks I’m using. As with the keyring, the level of detail on these is very impressive. Capturing both the controllers buttons and D-Pad there appear to be no faults or noticeable errors that I can see. Again, quality was an important factor in the design and creation of these it seems. Now here is where personally things get interesting for me, whilst I wouldn’t ever use these for their intended purposes, as a collector of game related stuff, I don’t particularly care, I could so easily place these on a small glass block and place them inside a display cabinet, or mount them onto a board and display them. Whilst as a practical item of clothing they’re fine, as a collectors piece they are also highly attractive. My stance on these is similar to that of the wallet, as a practical thing, it does exactly what it should, however unlike the wallet, these a much higher cool factor to them, as a collector I’m already thinking of places and ways I want to display them, odds are some of you are probably doing the same. The price tag on these is £14.99, which feels about right if I’m honest with you. The products I was sent to look at are really cool and of excellent quality, even if I try to find faults or deliberately look for a problem, I can’t find one, or the issue is so minor to complain about it would be petty. The only major problem I have is that I don’t like the wallet, but you could change the wallets design to anything and I still wouldn’t like it, because I prefer a different kind of wallet. But if you like that kind of wallet design/layout, it’s great, although there is no way to test the longevity of it, given the material it’s made from I doubt the design or the integrity will last forever. The keyring and the cufflinks for me are the main attractions and the best products by far. I utterly love them both, the keyring is an absolute bargain at it’s low price point. Sit up and take notice those people who buy licenses like this and produce cheap merchandise, or merchandise which is amazingly overpriced for what it is/does. Numskull have got it absolutely spot on, high quality merchandise which doesn’t cost an arm or a leg. Bravo. You can find these products on sale at YellowBulldog.co.uk, TSS members can get an exclusive discount so see this article for more details on that one. + The sense of cool which oozes all over the place when you see them in person. + Fiddling with the cufflinks. + Fiddling with the keyring. – Price of the wallet. – That wallet won’t last forever with regular use. Now we have a second opinion from another staff member, VEDJ-F. It should be noted that she bought these products using her own money. Everything written from this moment on is from the perspective of someone who used their own money to get the products. After the release of the pretty darn good console-themed notebooks (of which I want to get the other SEGA consoles other than Mega Drive), Numskull has delved into a line of paraphernalia dedicated to the SEGA console line, with wallets, keychains and even a pair of cufflinks. So here’s my two pennies on the line. Outside of the products themselves, the packaging is pretty swish, opting for the same sort of background as SEGA Ultimate Mega Drive Collection would use (only in purple for some reason). Each one has a unique blurb about the product or SEGA, and between the three I bought were references to MC Hammer and Streets of Rage, if only in the form of name drops. The packaging was a bit on the scuffed side (and the plastic wrap on the keychain a bit open at the sides), but I wouldn’t say it was major damage, nor did it affect the actual items. The first item in my grab list was the Mega Drive console wallet, although there’s also a MD controller design also available. The material feels like a faux leather kind of texture with some padding underneath, so it seems like it would be durable. 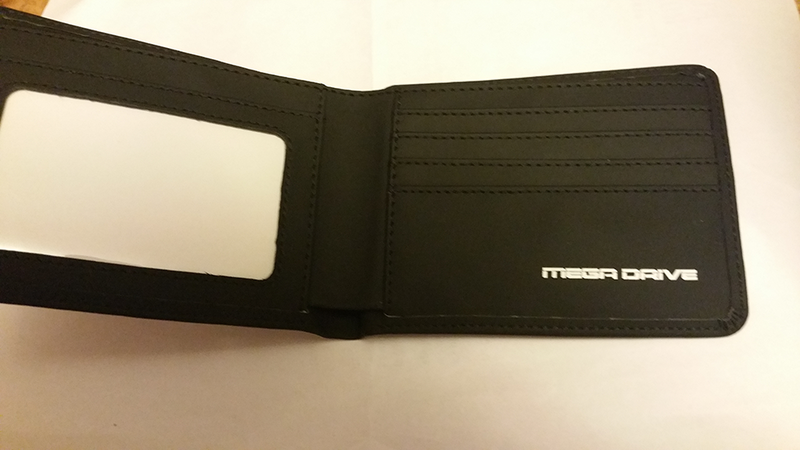 It’s a simple non-fastening wallet with the usual card slots and window slot for ID, so don’t expect any bells or whistles, just functionality (albeit with the Mega Drive logo embossed inside). The design, like the notebook before it, is a 2D graphic representation of the console, including the details on the bottom of the console as well. It’s simplistic, but the monochromatic and red colour scheme combined with the distinctive features means it’s still very nice to look at. £15 was what I paid for this wallet, and that tends to be the going price for these sorts of collectables. I would have personally put it a bit lower at maybe £12 given the simple function. The second item I got was the pair of cufflinks. The cufflinks are metal aside from the design front which is plastic for both. 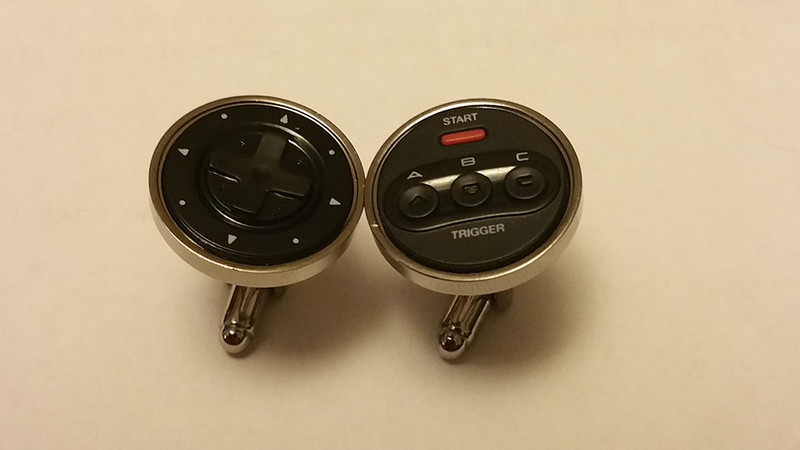 These are fashioned after the controllers of the Mega Drive, one for the trigger buttons and start, the other for the D-pad. It’s an interesting thematic choice, and it makes for a fun, unconventional matching pair. It’s especially nice when the details are actually raised on instead of simply drawn, gives an extra sense of effort in them. That said, I’m not sure how much use these would get outside of novelty; the situations where you’d need cufflinks are pretty limited and usually very formal, but if you want to have some fun with it, then by all means do. Like the wallet, these were £15 for the pair, but I have no idea on conventional cufflink market prices. The last item of the bunch was the Mega Drive keychain, but there is also a Master System one about. I was expecting this to be a block of rubber, so I was very surprised to find out this is actually all plastic, so the charm won’t be as prone to damage from knocks and snags. Despite its small size, it’s a very faithful recreation of the console in charm form. The vents, the bottom panels and the cartridge slot flaps are all textured, there are even tiny switches and the reset button has the texture painted on. The chain itself is also very well secured into the charm, so it’s not coming loose unless the chain itself breaks. It’s probably my favourite item of the bunch for how far they went in being faithful to detail, and at £5 it’s also the item that’s most affordable with pocket money change. Overall, I’d say these items are very nice. For all I’ve said about merchandise often being a bit dearer than bog standard, you can’t say Numskull didn’t put in the effort to give bang for your quid. You might be better off with something more plain if you just want something that functions, but if you want a little bit of flair to your possessions, are a fan of SEGA, are taking part in a Secret Santa or just want a little something to give as a gift, you can’t go wrong with these (unless the recipient was on the Nintendo side of the console war).